Fire Engines Photos - Bedford TK? Part of the RAF Manston Museum photographed at RAF Fairford Air Show July 2008. Reminds me of the Fireman Sam fire appliance! It looks like a Bedford TK. However, regarding the front design it looks like 'Jupiter 999 (J999)' use in Fireman Sam series 1 (1985). Added by Bomba Boy on 15 July 2008. What a strange looking TK. Can't make up my mind what it is I don't like about it. Added by Dave Lewis on 21 July 2008. Added by Lee on 08 August 2008. Added by Mark on 14 October 2008. These Bedfords were fitted out for the RAF by HCB Angus in the early seventies to replace an older model Bedford "domestic" pump. They were basically a "b type" and were well liked by most crews. A later version was made with a higher roofline and less locker space and equipment. Added by John Stott on 01 December 2008. Looks like it is a Pump, Ladder; and maybe a Water-Tank - to protect structures on the air-base. Added by Pat Rivers-Bowerman on 01 December 2008. Hi Pat, it had a 400 gallon water tank, Godiva 450 to 650 gpm pump and carried a 35 feet alloy extension ladder. A "b type" appliance refers to the Home Office specifications for pump / ladders. The TK series were one of the most popular appliances in the UK in their day and still have many devotees! Hi john, lots of useful info there! yes, yes and yes on pump, tank ladder etc, etc. My appliance was first road registered in 1984 but had obviously been in raf service for many years. Despite googling hcb angus and godiva I have been unable to find any further history - so thank you very much and if you have any other info I would love to hear it. Added by Lee on 01 December 2008. 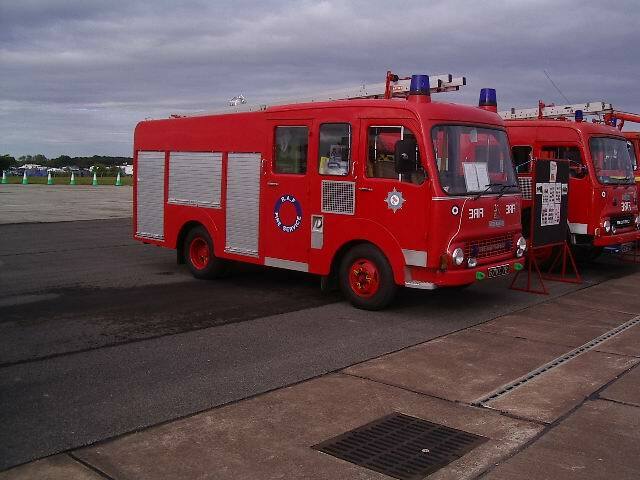 Added by John Stott on 02 December 2008.
there are three museums at Manston, The spitfire and hurricane memorial building, The manston fire museum, and the RAF Manston museum, they all have fire engines, but are seperate museums. Added by DOUG COCKLE on 09 December 2010. Added by Gordon Smith on 10 December 2010. I think the thing that makes this vehicle look odd, is the small wheels, most TK Bedfords, had larger ones. I would assume this one carries much less weight too. If you look at the wheel arches you can see the extended bodywork panels, to cover in the gap (fill the space above the small wheels) It also looks to me as if the front an rear locker shutters are not as wide as a standard appliance, so this too could indicate less stowage, so less weight. Added by Michael G. on 11 December 2010. Does anyone know the military of civilian reg of this vehicle? It might be the one we now look after. Added by Jon Booty on 19 September 2018. Identity confirmed. It now lives with us! Still fully operational and kitted out. Better still, it lives safely in an RAF Fire Section. Added by Jon Booty on 15 December 2018.